Bluefin details an exciting new series of high-detail Limited Edition products from collectibles brand, Iron Studios, with the forthcoming release of the Battle Diorama Series. Set to be unveiled for the first time at the 2017 Comic-Con International, these Limited Edition 1/10scale statues depict an array of beloved heroes and supervillains. Anaheim, CA, July 13, 2017 – Bluefin, the leading North American distributor of toys, collectibles, and hobby merchandise from Japan, Asia and more, details an exciting new series of high-detail Limited Edition products from collectibles brand, Iron Studios, with the forthcoming release of the Battle Diorama Series. Set to be unveiled for the first time at the 2017 Comic-Con International, these Limited Edition 1/10scale statues depict an array of beloved heroes and supervillains. Each one is hand-painted and rendered in Polystone and presented on a detailed display base and ready for battle. 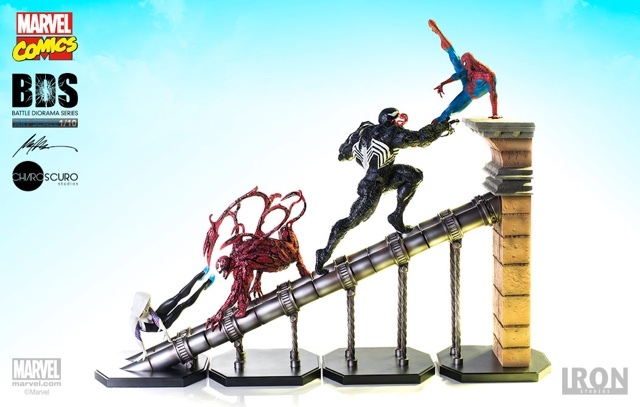 Combine each 10-inch statue with others in the series to create a kinetic diorama that is sure to become a centerpiece of any fans’ personal collection. The first statues in the Iron Studios Battle Diorama series will be on prominent display at Bluefin’s booth during the Comic-Con International and will include Spider-Man, Spider-Gwen, Venom and Carnage! The first of these figures will be available via retail channels beginning in November with additional ones set for release in early 2018. Pre-orders are available now from authorized Bluefin retailers nationwide and also from a variety of leading online outlets. Also set to be showcased for the first time at Comic-Con will be new Batman: Arkham Knight statues along with prototypes for additional upcoming Iron Studios statues based on the recent Wonder Woman movie by Warner Bros. and several Marvel-based characters. Available in Limited Edition quantities as a 2017 Comic-Con Exclusive will be the Iron Studios 1/10Art Scale Batman: Arkham Knight Bronze Version. 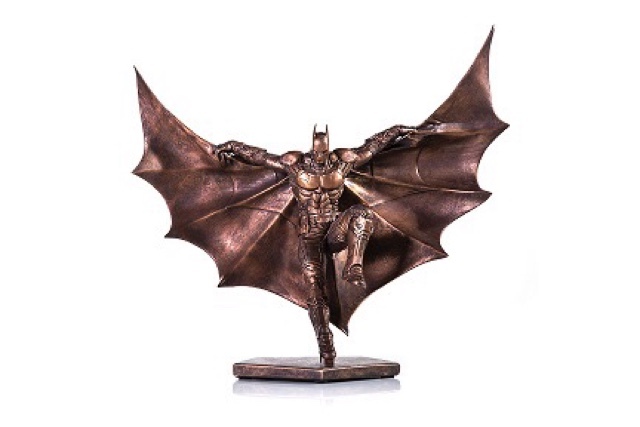 This stunning 10-inch statue is available only from Bluefin for $149.99 and based on original 3D references from the action-adventure video game developed by Rocksteady Studios and published by Warner Bros. Interactive Entertainment. Founded in 2010, Iron Studios is headquartered in Brazil and specializes in a wide range of incredibly accurate and lifelike 1/10 scale products. For additional information on Iron Studios, please visit https://www.facebook.com/ironstudios and http://www.ironstudios.com.br/. Limited Edition hand-painted statue based on the concept art of Raphael Albuquerque from Chiaroscuro Studios; includes base display.